We used the first broad beans from our garden to make this dish and there's nothing better than eating fresh vegetables picked from your own garden! 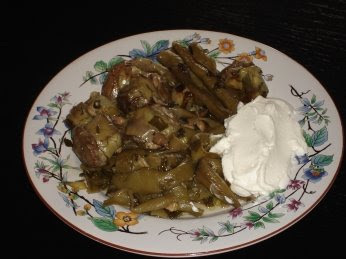 This dish is ideally served with Greek strained yoghurt (see photo). Cut off the ends of the bean pods. Place the beans in their pods in a large pan of boiling water and allow them to boil for 2 minutes. Discard the outer leaves of the artichokes and rub the artichokes with the lemons. Place the artichokes along with the used lemons in a bowl of cold water. Place the beans and the artichokes along with the other ingredients in a covered, ceramic oven dish and add a cup of water. Stir them well and bake them with the lid on in a pre-heated moderate oven for 1 hour.